As noted in previous articles JC and I go back a long way, back to the early 60's on Michigan's old Au Sable. Like all classic friendships we accumulated certain traditions over time, and one of our traditions was our annual lake trout planking. JC's father had a cabin near Traverse City, Michigan, and he also had a boat that he used to troll for lake trout on Grand Traverse Bay. Since we were always camped along the Au Sable every weekend from April until September, and it was just a short trip from Grayling over to Traverse City, in early June we would make the trip and spend a morning trolling for lake trout. Normally we would end up bringing home a laker that JC's dad had caught before we arrived since our luck at catching them seemed to be quite poor. If fishing had been especially poor we could always buy one from the local commercial fishermen. However we procured one we would take it back to our campsite to prepare a repast fit for a king. As I indicated, in those days we were all hardy campers, and each weekend we would gather together for a time of fishing and camaraderie. Along with JC and myself there was an assortment of other fellow anglers including my older brother Bob. Growing up during the Depression Era on a dairy farm in upstate New York my older brother was quite accomplished with a double-bitted ax. Camping was never camping unless we had a campfire, and my brother Bob kept us well supplied with wood. He would disappear into the woods as soon as we arrived at the campsite and within a few minutes would have a dead tree reduced to a pile of split wood ready for burning. In those days we always had a campfire going from the time we arrived on Friday night until we left on Sunday afternoon. It was tradition. My brother Bob's prowess with an ax and saw were vital to the success of our lake trout planking tradition. While JC and I were attempting to secure the lake trout, my brother Bob would be securing the necessary wood. While Jack Pine is suitable for a fire to roast hot dogs it will not do for the type of cooking we were planning. Along the Au Sable there are oak trees, mostly small, gnarled specimens, but having all the necessary characteristics for making just the right type of fire for planking. Oak wood is hard, and it produces a wonderful bed of hot, long burning coals; just what we needed for planking our lake trout. Brother Bob would scour the woods looking for just the right tree. A dead, standing oak was needed, and the longer it had been dead the better. Brother Bob never failed to produce just the right tree for the purpose. 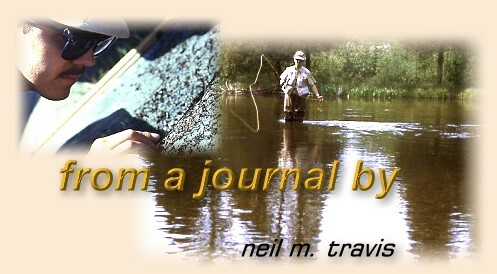 Know if you are not familiar with planked trout the process is both simple and complex. If you are planning to plank a trout this is what you need. First, a seasoned hardwood plank at least 20 inches wide and 2 inches thick, preferably Oak or Maple. Along the sides of this plank you need to drive some nails every few inches leaving about 2 inches of the nail head sticking out of the plank. Then you take your fish and split it right down the middle leaving the two fillets attached. Place the fish, skin side down, on the plank and secure it to the board by using wire attached to the nails and crisscrossed over the fish from top to bottom. While we were preparing the fish my brother Bob would be preparing the fire. He would build a substantial fire using the oak that he had cut. When he had created a large pile of coals we would bring over our planked trout and place it next to the fire. By adjusting the angle of the plank and its distance from the hot coals we could cook the fish by the reflected heat. Lake trout are an oily type of fish, much like members of the salmon family, and this helps to keep the flesh from drying out while it is cooking. To aid that process we would occasionally drizzle melted butter over the cooking trout. When the trout was cooked it would be taken, board and all to the table, the wires would be removed and the plank would serve as a serving platter. It was a feast fit for a king.